One of the most popular and highly recognized standup comedians on the road today has also made quite an impression in the television, film and radio arenas. D.L. was recently heard on the New York airwaves, as host of the morning show on WRKS-FM. D.L. also serves as a weekly contributor to the nationally syndicated radio show, “The Tom Joyner Morning Show.” First and foremost a standup comedian, he starred in his 5th stand-up special “Reset,” which premiered in July 2012. In addition, D.L.’s first humorous book title, “I Want You to Shut the F*ck Up,” was released in August 2012.D.L. is competing in season 16 of “Dancing With the Stars” alongside his dancing partner Cheryl Burke. Do you want to hire D.L. 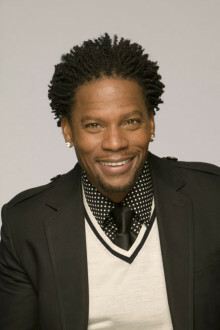 Hughley? Directly request a quote. In 48 hours we can send you the availability of D.L. Hughley If you would like to book D.L. Hughley, Entertainment Booking Agency is the right place. We will offer you the best price and contact the management or we directly contact D.L. Hughley. For corporate appearances or speaking engagements you can contact our agents and the will help you true the process. Tags: hire D.L. Hughley, D.L. Hughley booking, book D.L. Hughley, D.L. Hughley appearances, find more information on booking D.L. Hughley for appearances, D.L. Hughley speaking engagements, D.L. Hughley endorsements/spokesperson, D.L. Hughley appearance fees, D.L. Hughley booking agency contact info, biography of D.L. Hughley, Contact an artist booking talent agent find a speakers bureau that can book D.L. Hughley, speaker booking agency for D.L. Hughley, D.L. Hughley booking agency, D.L. Hughley booking for corporate event. EBA is one of the biggest entertainment booking agencies in the World. We book hundreds of celebrities, artist, athletes and speakers in a year. Important to know is that we are not claiming to be the management of D.L. Hughley. We are not the official agent for D.L. Hughley. Companies from around the globe book these artists and speakers true our company be course we have one of the biggest networks and we always have direct contact with the artist or the management. We help you to find the right celebrities for your corporate of private events. Please contact one of our agents to get free advice and we will help to get the world-famous artist on your party.